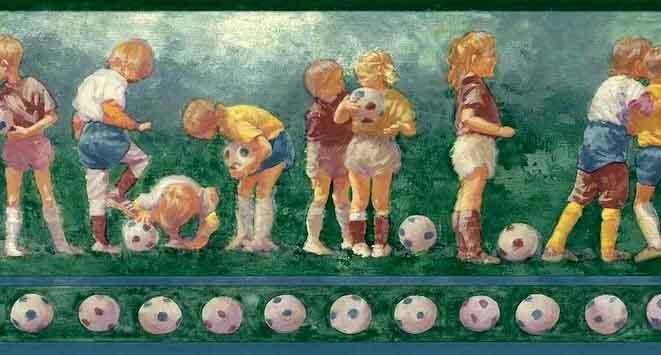 Vintage soccer balls wallpaper border features young boys and girls playing soccer. It has a watercolor quality about it. 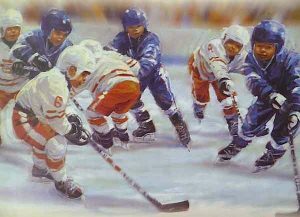 The players are in White, Red and Blue. They have Blond hair and the soccer balls are White with either a Red or Blue pattern. There is a Green field and a Blue sky resulting in a natural look. The top of the border edge is a narrow Green band and the bottom edge consists of blue bands surrounding a continuous line of soccer balls.